If you have received a Skype message, asking something like ‘Hey, is this your Skype profile pic?’, you should ignore it and never click on a link, which is also included into the body of this message. According to our research center, it will lead you to a dangerous virus, Dorkbot worm, which is actively spread using this service at the moment. We have already seen other versions? of Dorkbot on Facebook and Twitter, so now it seems that it’s Skype’s turn. Typically, this campaign is based on a message, which looks like it was sent by one of your friends but in reality is used to infect computer with Dorkbot worm and include the machine into the botnet. Every PC user? can also be included into the distribution of this worm against his/hers will if computer is infected with this threat. As a result, all victim’s Skype friends will keep receiving ‘Hey, is this your Skype profile pic?’ message. Clicking on the misleadingly named link downloads a ZIP file, which contains some executable files of Trojan viruses (Troj/Agent-YCW or Troj/Agent-YDC). After a small research it has been found that trojan opens the backdoors of the system and gives for the attacker an ability to take over the whole computer. Additionally, this infection includes computer into a botnet and may even infect it with ransomware, such as FBI virus or FBI Moneypak virus. There is no wonder why many users have already fallen into this trap – ? 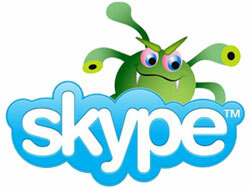 every talks about Facebook’s security and forgets about being careful on Skype. We highly recommend being careful with ALL suspicious links spread on the Internet. If you have been infected by this virus and now your Skype’s friends complain about these ‘Is this your new profile pic?’ message, note that reinstalling won’t help in this situation. You must run anti-malware scanner to remove trojan from your computer. This entry was posted on 2012-10-10 at 03:23 and is filed under News, Spam and phishing, Spyware related issues, Viruses and parasites.